Float is great for a startup/small (< 20 employee companies) that have limited resources for keeping an eye on cash flow. Yes, you could hire a contractor CFO, but it would simply be less expensive to use Float and educate yourself a bit about cash flow. For larger companies I feel like you would have a dedicated financial controller or CFO that may already have tools they are familiar with, but this service might also still be useful. Forecasting out how much you can spend. Model - It takes a little bit of time to get familiar with how the model works. Quickbooks integration could be improved to automatically include recurring transactions. Pricing is a little steep for smaller businesses. My rating of 9 is really a composite of two ratings. For the users, I would give it a 10. But for administrators, I would give it more of an 8. That is because there is definitely a learning curve for the admins. It has a fair level of complexity (which is necessary), especially in the formulas and certain types of sheets. It is a product worth mastering, but it does take time to learn. Cloud-based allows for access anywhere. Very little downtime. Support questions are always answered quickly. Although having a set of spreadsheet and workbooks helps to define the logic and processes, preparing a requirements document is also an important element in a successful implementation. In addition, dedicating a knowledgeable user as part of the "Scrum" development allows focus and permits the implementation to proceed without time loss and promotes knowledge transfer. Finally, having an onsite developer speeds the process and can reduce the overall cost as well. I have used Hyperion and TM1 solutions in the past. Hyperion was expensive and difficult to implement, requires more technical knowledge to set up the business rules for more more hands on IT support. TM1 was a great tool for FP&A users. However TM1 lacked a report writer and was not a cloud based solution so access for international offices and those who traveled frequently had challenges. Adaptive offers a well-rounded solution cost effective solution with easy access, user friendly interface, built in report writer and dashboard capabilities. Easily will save 75% of finance team time on budgeting and planning. 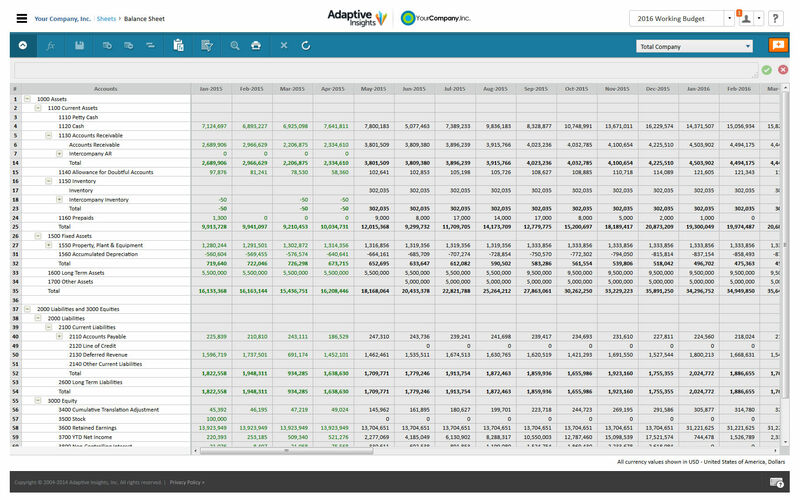 Improved cost control, budgets, and forecasts are at the users' finger tips with actuals vs. budget vs forecast. No excuses to overspend and allows finance to be better business partners. We've had a positive ROI since we're able to take bigger risks now that we understand how much cash will be in our account on what day. We are able to make adjustments to our contractors and services to grow our business faster.